2017 Festival of Nine Lessons and Carols: Hymn: "O come, all ye faithful"
Sinden.org published its traditional preview of the music list for the Festival of Nine Lessons and Carols from King's College, Cambridge late last month. For the days leading up to the service, we have been offering a Kalendar of Carols: a more in-depth look at each piece of music to be sung. So far, we've covered the opening hymn, Bidding Prayer, In the bleak mid-winter – Harold Darke, Adam's Fall – Richard Elfyn Jones, Love came down at Christmas – arr. Stephen Cleobury, How shall I fitly meet thee – Bach, I saw three ships – arr. Ledger, Illuminare Jerusalem – Judith Weir, and the hymn "O little town of Bethlehem", A spotless rose – Herbert Howells, The Lamb – John Tavener, The Angel Gabriel – Pettman, The Linden Tree Carol – arr. Cleobury, this year's commissioned carol by Huw Watkins, Away in a manger – Willcocks. 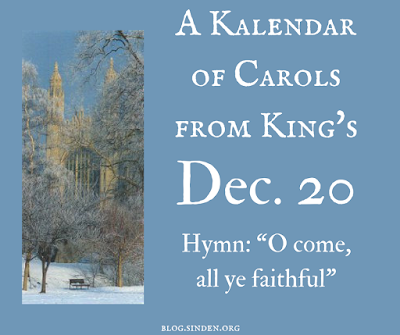 Can I not sing but hoy – Francis Jackson, the hymn "God rest ye merry, gentlemen", We three kings – arr. Neary, and The Magi's Dream – Whitbourn. We have reached that tipping point in the service when we know everything that follows. The Ninth and final Lesson is read, introduced, as always, with that most wonderful of the pithy lesson summaries: "Saint John unfolds the great mystery of the Incarnation." When I was growing up in a Presbyterian Church that was duly Angliphiliac at Christmas, the long-tenured pastor intoned these words with great solemnity. They lodged in my mind. It wouldn't quite be Christmas without them. And whatever does "unfold" mean? It doesn't mean "explain", because who could ever truly explain a mystery? But it does lay it out in all it's fullness. Interestingly, we had that word "unfolds" quite a bit earlier in the service in Howells's "A spotless rose", sung after the Fourth Lesson. But, as usual, I digress. After all this unfolding, our best response is to worship. And the hymn "O come, all ye faithful" is perfectly suited to this task. "O come let us adore him" indeed. There's a nice symmetry to hearing this carol service "wrap up" with this hymn at the end. So many services of Holy Communion begin with this same hymn. Starting at least as far back as the 1930s, this hymn has been traditional in this slot after the Ninth Lesson. In the first service at King's in 1918 the hymn was "The First Nowell", but there's something not quite right about that. It doesn't carry the same weight that the Ninth Lesson does. (Although it should be noted that the Ninth Lesson that year was Galatians 4:4-7 – can you imagine not ending with John? Some liturgical changes are for the better!). The hymn is sung this year in the well-known arrangement by David Willcocks. (Tuba solo on stanza 3 with descant, stanza 4 in unison with alternate harmonization).